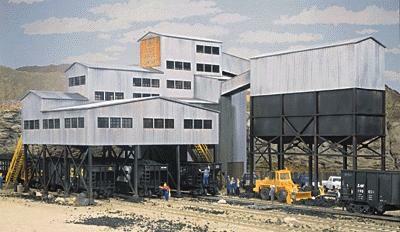 This is the HO Scale New River Mining Company - Kit - Main Building- 12-1/2 x 9 x 9-3/8'' from Walthers. Retail $59.98 SAVE 16% ! Great kit to build. Construction was easy and detail is excellent. A very popular kit, the prototype was built in the early 1950s and is similar to those found in all parts of the country. I bought this mine for my son and I, for our railroad. Kit is kind of hard to put together because of all the glueing. It&apos;s a excellent kit and recommend it to anyone wanting a mine on their layout. "wonderful if you follow for assembly, video and painting video on youtube the model assumes an incredible look"
This was the first kit that I ever purchased. It was easy to build, fun, and enjoyable. The Coal mine also looks great, and lends itself to a lot of customization with weathering, coloring, etc. A great kit that can be enjoyed by the novice or expert.